Arrival at IXB (Bagdogra Airport) or NJP (New Jalpaiguri) Railway station and transfar to Phuentsholing (Bhutan). After breakfast complete the immigration formalities and transfer to Thimphu (7,710 ft.) the capital city of Bhutan - On arrival check in at the hotel. In the evening, visit the TashichhoDzong (Fortress of the Glorious Religion) – Overnight stay at Thimphu. After breakfast visit KuenselPhodrang (Buddha Statue) a place for refreshing with a huge statue of Buddha on the top of the KuenselPhodrang, National Memorial Chorten (Monument) & Folk Heritage Museum - Afternoon visit Sangaygang View Point, Changangkha Monastery, Takin Preserve Centre, the national animal of Bhutan can be seen here – Overnight stay at Thimphu. Morning after breakfast chick-out for hotel & proceeds for Punakha transfer – On the way vistiDochu La Pass (3100 Mtr.) – where on a clear day you can get spectacular views of the Himalayas – After that drive for Punakha - The former capital of Bhutan and visit PunakhaDzong – which is noteworthy both for being one of the most beautiful dzongs in Bhutan and also for having been built by the first Shabdrung in 1637 .Night stay in Punakha. After Breakfast, check out from Hotel & Transfer to Paro. of the DrukgyalDzong, built in 1647. Paro’s Main street features shops on both sides, all crammed with brasswares, silk and cotton scarves, incense sticks, silver filigree jewellery, Evening at your own leisure. Overnight in Paro. 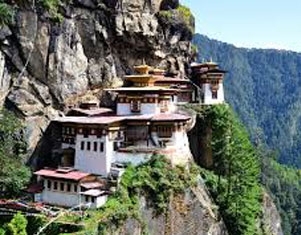 After Breakfast: Visit -1) View of Taktshang Monastery, 2) Kichulanka Monastery, 3) Ta Dzong, 4) ParoRinpungDzong (Museum), 5) Nya-meyZam, 6) DungtseLhankhang, 7) KilaGompa, 8) DrukChoeding. In Evening: Stroll Through the Market of Paro& Overnight Stay in Paro.